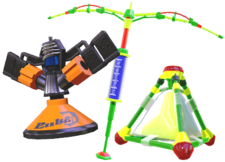 “ Divert the enemy with weapons like Splat Bombs or the Sprinkler. Pro tip: You can try out the weapons at Ammo Knights before you buy. The sub weapon is a secondary weapon in Splatoon and Splatoon 2. They use up considerably more ink than a main weapon, and as such, usually serve specialized purposes limited to specific combat situations and are not often used as the main method of inking the environment. Sub weapons are deployed by pressing . If the sub weapon is throwable, holding down will display a trajectory to help the player aim the weapon. If the sub weapon is not throwable, it will be placed on the ground. Sub weapons consume a great deal of ink, so it may be necessary to monitor the ink supply before and after deployment of a sub weapon. When the ink supply becomes sufficient for using a sub weapon, a sound effect will play and a red light will show on the ink tank. Abilities on a player's gear can affect sub weapons. The following abilities have effects that specifically focus on improving the performance of sub weapons. Concept art of various sub weapons. Sub weapons come in sets with main weapons. These lists show which sub weapons come with each main weapon. This page has been accessed 76,624 times.